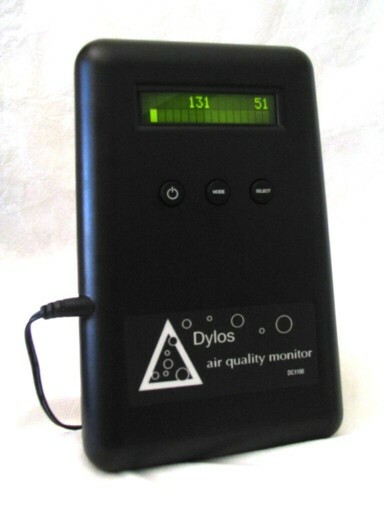 If I could have just one device for measuring air quality, this… Well, this would not be it. It does not measure CO2. It does not measure humidity. It does not measure temperature. It does not have a Web server or a wireless card or indeed any connectivity whatsoever. It does not have a battery. It does not even measure the same thing government agencies use for their air quality indices. What it does do is provide a high-quality laser particle count. And hey, do you really need a Web server to count particles? That was when I placed my order. OK, so technically just one thing sold me. Some brief history. Prior to 2007, a decent particle counter cost thousands of dollars, and a cleanroom-quality counter ran $10K or more. Then this little company came out with this device, and various labs started comparing it to their research-grade equipment, and found… Hey, it works pretty well for a sub-$300 gadget. Many amateurs use the Dylos as their “trusty” golden reference. I feel like I know these guys… They are old-school ninja EEs. If you ever met a real monster Electrical Engineer, you know what I am talking about. Give one a soldering iron1 and some coffee, come back later, and you are guaranteed to see something amazing. Just don’t touch it. I wanted to make mine portable, so I bought an XTPower MP-10000 external battery pack. Works great. If you want to pull samples from the device, for a modest extra charge Dylos will provide an RS-232 serial output. If you do not know what that is, or even if you do, I do not recommend it, because there are other devices you should buy in addition. All right, all right, “instead”. A topic for a later installment. The sole difference between the Pro and non-Pro versions is that the former is calibrated to see particles down to 0.5 microns, while the latter “only” sees down to 1 micron. I will close by mentioning this device’s relevant limitations. It sees water vapor as particles, so the measurements vary based on humidity. It only provides a count of particles, while all of the “standard” air quality metrics are based on particle mass, not particle count. This is not as bad as it sounds for two reasons. First, the use of particle mass was an arbitrary choice based on research in the 1950s; more recent research suggests some negative effects are better correlated with particle count anyway. Second, if your ensemble of pollution sources is fairly stable, particle masses and counts are well-correlated to each other. It does not “see” ultrafine particles. But neither does anything else at any sane price point, for now. Bottom line: While this is not the only device I would want to own, I am glad to have it.